Made famous by his familiar work in the popular Saturday Evening Post magazine, we present eight covers that featured Americans with their indispensable automobiles. They are listed in chronological order, from 1920 to 1954, with descriptions by Rockwell biographer Christopher Finch, and by Donald Stoltz, President of the Norman Rockwell Museum. For more than half a century, Norman Rockwell lovingly encapsulated life in America though his art, and in doing so became its most loved artist. "The view of life I communicate in my pictures excludes the sordid and ugly," Rockwell wrote, "I paint life as I would like it to be." 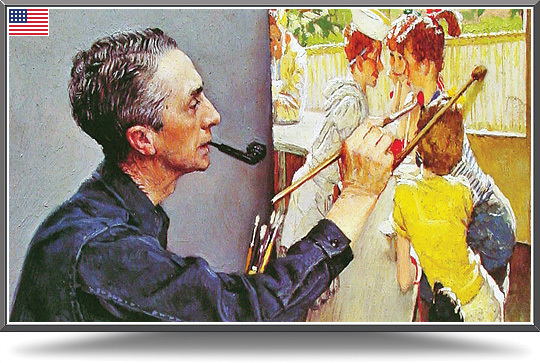 Norman Rockwell was very prolific, producing over 4,000 original works, most of which were either destroyed by fire or are in permanent collections. Best known for his sentimental and humorous pictures, Rockwell also movingly addressed complex social and political issues. His first cover for the Post was produced in 1916 when he was only 22. Over the next 47 years, Rockwell produced 321 covers! He then spent 10 years painting for Look magazine, where his work depicted his interests in civil rights, poverty and space exploration. During his long career, he was commissioned to paint portraits for Presidents Eisenhower, Kennedy, Johnson, and Nixon. Rockwell was also commissioned to illustrate over 40 books including Tom Sawyer and Huckleberry Finn. In 1977 he was awarded the Presidential Medal of Freedom -- the United States of America's highest civilian honor -- for "vivid and affectionate portraits of our country."